Heidi Schlegel (15) attempts a shot during last season’s opener against Virginia Commonwealth University. 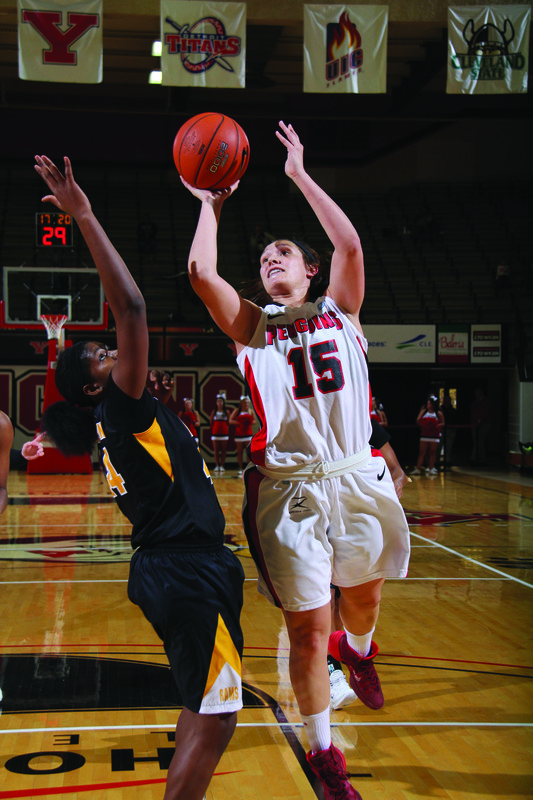 Schlegel finished second on the team in scoring with 31.6 points per game.Photo courtesy of YSU sports information. 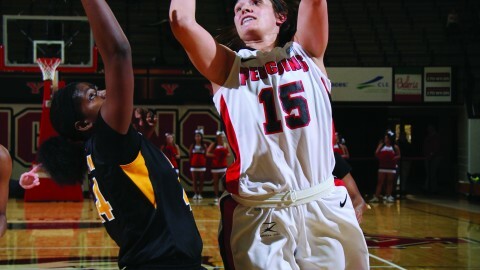 Much uncertainty faces this year’s Youngstown State University Women’s Basketball Team. The Lady Penguins are replacing four seniors, including two starters, with seven true freshmen. YSU is the only school in the Horizon League with that many freshmen on their roster. Head coach John Barnes said that he definitely expects some freshman to play. Barnes said he would like to have a roster full of experienced players but is aware that the younger players will have to step up and play this season. This will be Barnes’ second season coaching YSU. Last season, Barnes set a new school record for wins by a first-year head coach with 15 and also led the team to its best ever start in conference play by winning the first six games. He has high expectations for this year’s team despite the lack of experience. “I’m expecting to play really hard — to be a really tough team, and if we can do those two things I mean anything can happen,” Barnes said. Barnes will rely heavily on his front court as he returns two starters, senior forwards Latisha Walker and Heidi Schlegel. Walker averaged 7.1 points and 6.0 rebounds last season. Schlegel earned First Team All-Horizon League honors last season, and has been named to the preseason First Team All- Horizon League this season. She averaged 20 points per game last season and finished with a total of 621 points, fifth most in school history. She also set school records for free throws made with 192. Schlegel said she looks forward to being more of a coach out on the floor this year, as she hopes to be a coach once her playing days are over. Sophomore guard Jenna Hirsch is the only other returning starter. She earned Horizon League All-Freshmen Team last season, averaging 7.3 points and 3.1 assists per game. Hirsch must transition from being an inexperienced freshman a season ago, to being one of the more experienced players on the team. Hirsch and Schlegel both agree that culture surrounding the program has completely changed from a season ago. Both say that the team has better chemistry and that the team as a whole has really bonded together. YSU opens up the season against Niagara University on Nov. 15.